We had a freak snowstorm last week. It seemed to come out of nowhere; one minute it was fall, the next we were in high winter; wind blowing, snow blasting out of the sky and piling up on the roads. I’d planned a trip to the grocery store, but that was out of the question. The plows weren’t out, the driveway impassible, the roads slippery. Fortunately, I had some oysters sitting in the refrigerator. I’d planned on eating them raw, but now I changed my mind. 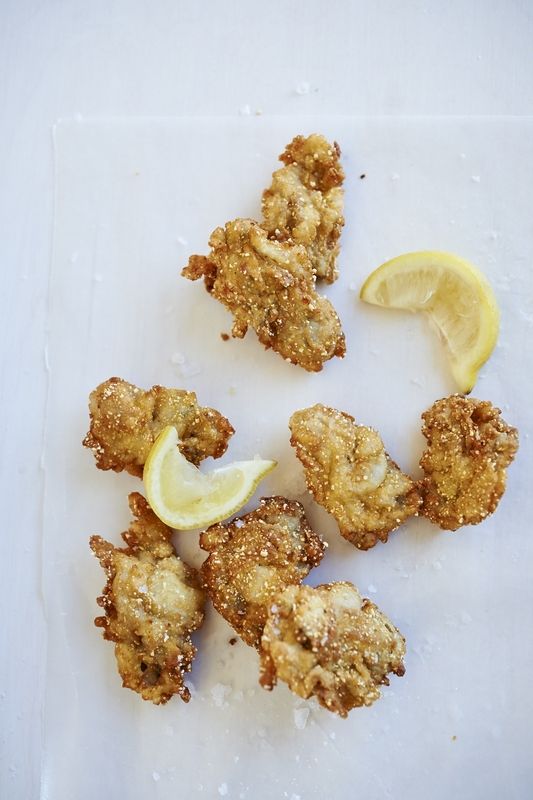 Here’s the thing about fried oysters; they’re one of the foods that truly reward the home cook. Eaten just seconds out of the fryer they give you the sense that you’re eating clouds. 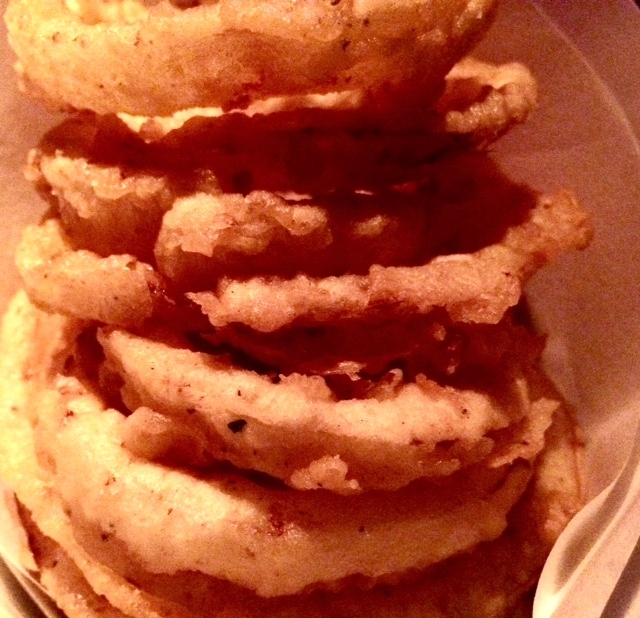 Order them in a restaurant, and in the time it takes to reach your table they lose much of their magic. You could shuck your own oysters, but unless you’re really an expert that makes the entire process a whole lot harder. 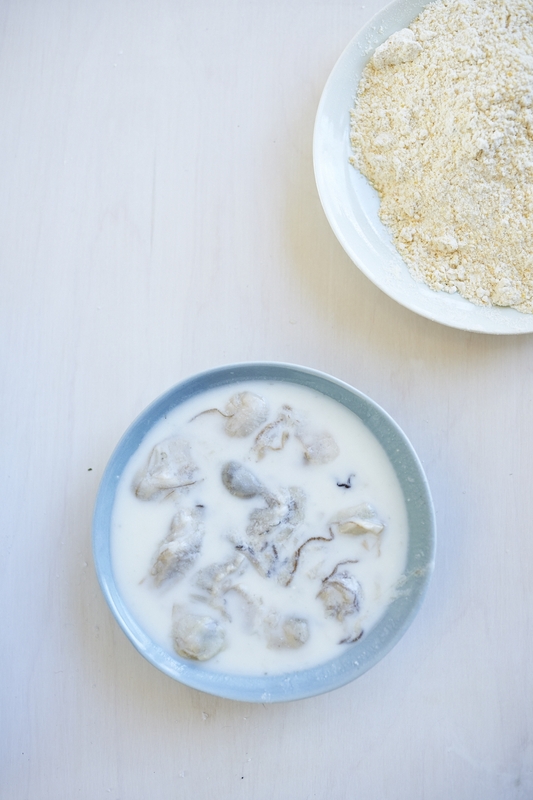 I open my own oysters to eat on the half-shell, but when I’m frying oysters I buy them pre-shucked. It’s a perfect applesauce day, and the kitchen has been perfumed with the good scent of apples slumping into sauce, sending out little hints of lemon and cinnamon. With the sauce made, I couldn’t help myself; I used some of it to bake this cake. It’s a good keeper, and will make a find snack over the coming days when the light leaks out of the sky too early, slamming us into night before I’m really ready. Besides, there are days when I’d bake this cake for the pure pleasure of the aroma. When I was working on My Kitchen Year, I decided to put all the recipes in classic form, just in case the publishers balked at the conversational tone at the last minute. Happily, they didn’t; I much prefer the relaxed fashion of the recipes in the book. But for those who’d rather have marching orders, here they are. Cook the apples with the lemon juice, water, cinnamon stick, and sugar in a medium saucepan, uncovered, until the apples are soft enough to mash with a fork, about 20 minutes. Remove the cinnamon stick and season with more sugar to taste. Butter and flour a 12-cup Bundt pan. Break two eggs into a large bowl. Whisk in the sugar and the brown sugar. Add the grated ginger and the applesauce. Whisk in the oil and vanilla and mix until it is smooth. Whisk the baking soda, salt, pepper, cinnamon and clove into the flour in a small bowl. Mix this gently into the applesauce mixture. Pour the batter into a buttered and floured 12-cup bundt pan and bake for about 45 minutes, until it is set. Cool the cake for 15 minutes on a rack before turning it out and allowing it to cool. Make sure the cake is completely cool before glazing it. Put the cream in a small heavy-bottomed pot. Whisk in the sugar, salt and corn syrup and bring to a boil. Turn the heat down to medium and continue to boil for about 15 minutes, whisking every few minutes. 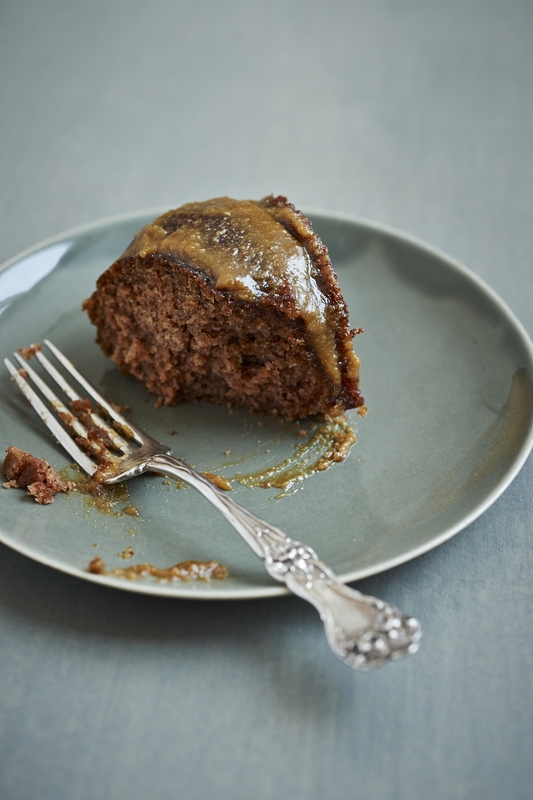 When the the glaze has come together into a smooth, thick caramel remove from heat and stir in the vanilla. Put the cake, still on the rack, over a sheet of wax paper. Carefully pour the glaze over the cake. 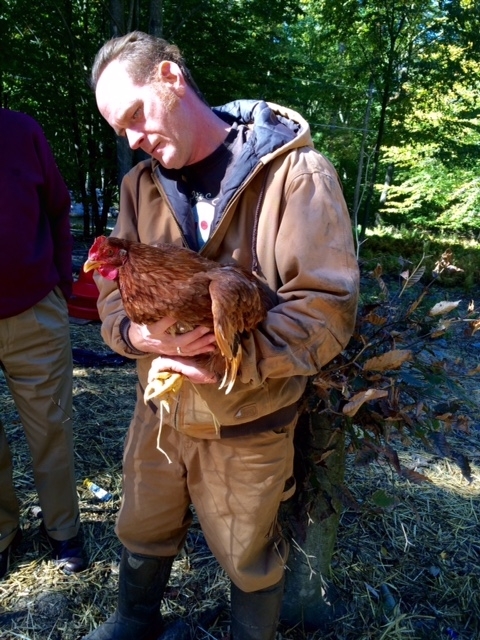 My brother came to town last week; he wanted me to drive him out to New Jersey to visit a chicken farm run by a friend’s son. He seemed to consider this a major treat for me. The truth is, chickens hold very little glamour for me. Half my neighbors keep chickens (mostly for eggs), and the ones I’ve cooked have not been all that scintillating. Besides, this farm Bob wanted me to see was two hours away, in deepest New Jersey, and reached by my all time least-favorite highway. Not a pretty drive. “But they’re raising Poulet de Bresse,” he insisted. Okay, now he had my interest; the blue footed chickens of France are pretty spectacular, and I’ve never heard of anyone in America who raised them. Besides… it was my brother. So off we went. Finding Voodoo Farm was not all that easy, but we lucked out; after driving around in circles, we stopped at the Blairstown feed store to ask directions. “They’re my neighbors,” said the woman who worked there, pulling up a chair to draw us a helpful little map. Oren and Cybele Ritterband are very much back to the land people. Artists looking for something saner than city life – and a healthy way to raise their children – they’re urban people with a passion for animals. The couple do almost everything on their small farm themselves, and they’re so attached to their chickens that they applaud those who escape into the woods and hang around to enjoy a ripe old age. Oren processes the birds himself – with a kosher blade – and then air chills them. Cybele does the butchering. They’re happy to show you where and how they do it. The birds – both the elegant Bresses and the dowdier Rangers look plump, happy and prosperous, and the whole operation seems funky and fine. “We won’t have any Bresse til winter,” Cybele said as we were leaving, sending me off with some of her homemade pate (fantastic), jam (excellent), and an enormous frozen Freedom Ranger bird. I stuck the free range chicken in the freezer, thinking that one day I’d cook it, but not any time soon. Much as I admired what the Ritterbands were doing, I was sure the bird would be a disappointment. Then I ran out of freezer room and put the bird in the refrigerator to thaw for a couple of days. When friends showed up unexpectedly for dinner last night, I told them, rather apologetically, that I was going to roast a chicken and not to have great expectations. Let me cut to the chase: this was, hands down, the best bird I’ve eaten in America. And it was easy to cook. I simply removed the bird from the refrigerator, pulled off all the fat (there was a lot), and stuffed it beneath the skin on the breast, and let it come to room temperature. I put a lemon in the cavity and trussed the bird. I showered it with salt and pepper. Then I heated a cast iron skillet in a 500 degree oven for about a quarter of an hour, plunked the bird into the hot skillet and cooked it for 15 minutes before turning the heat down to 325 degrees. At that point I threw some tiny new (unpeeled) potatoes into the pan, along with some carrots, quartered onions and whole cloves of garlic. I checked the bird’s temperature after an hour, cooked it for another half hour or so until the thigh registered 160 degrees, and let the chicken sit for half an hour. Wow! 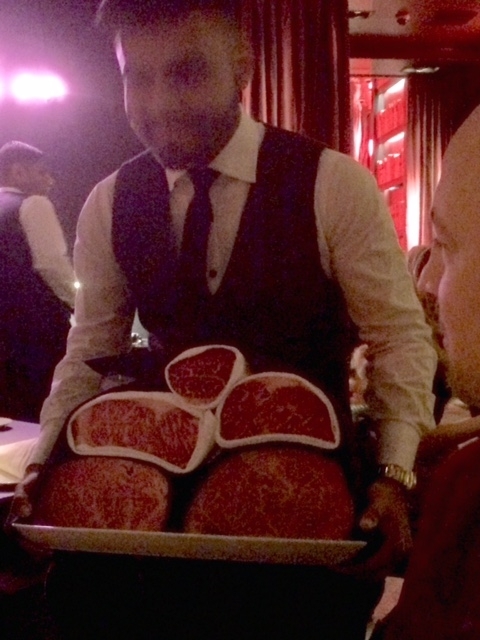 The skin was crisp, the meat moist, extraordinarily flavorful and not the least bit gamy. 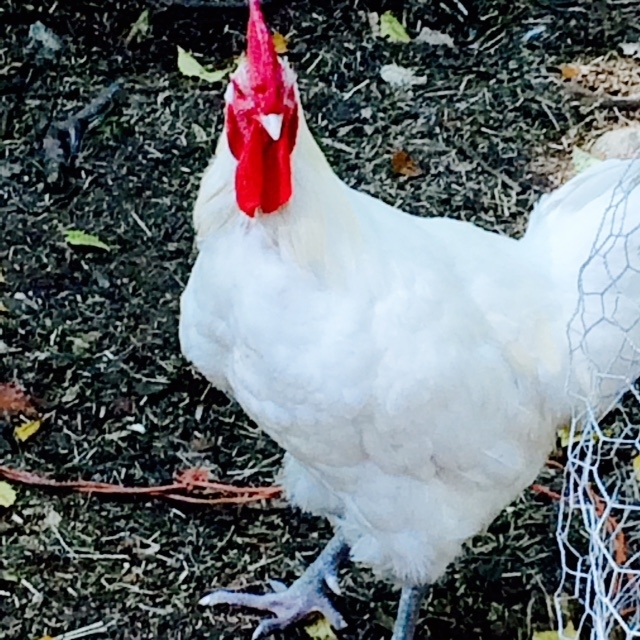 If this ordinary free-range chicken was so spectacular, I can’t even imagine how that Blairstown Bresse will taste. The beautiful bird at the top, of course, is the elegant Blairstown Bresse. The one Oren’s holding, below, is a Freedom Ranger. I asked for Roquefort. The cheesemonger unwrapped the wheel and offered me a taste. 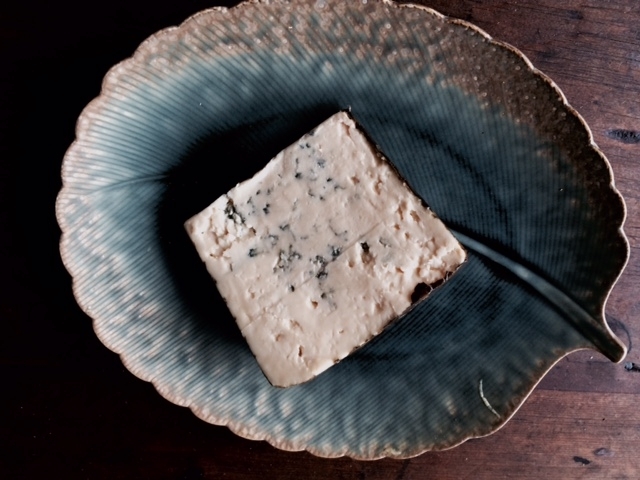 I love this classic blue, and nodded happily as the salty bite of the cheese hit my tongue. Then, looking rather sly, he unwrapped another wheel, scooped up a small bit and held it out. “Now taste this,” he said. 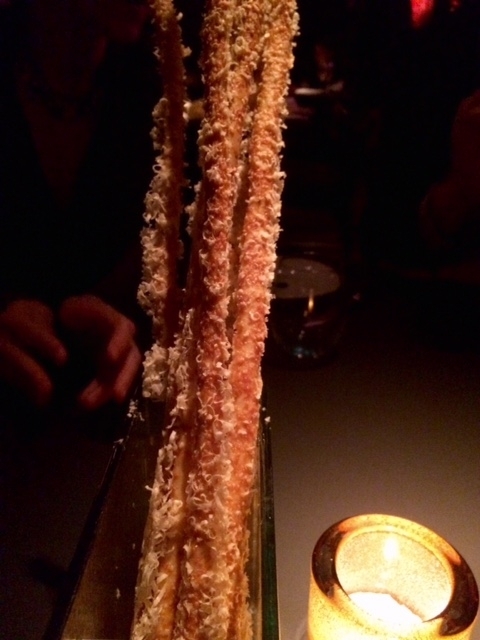 The flavor was extraordinary, and unlike anything I’ve experienced before. It was round, deep, rich, slightly sweet and fruity with that blue edge that hovers on aching intensity. The texture was tender as fudge. Of course I had to. 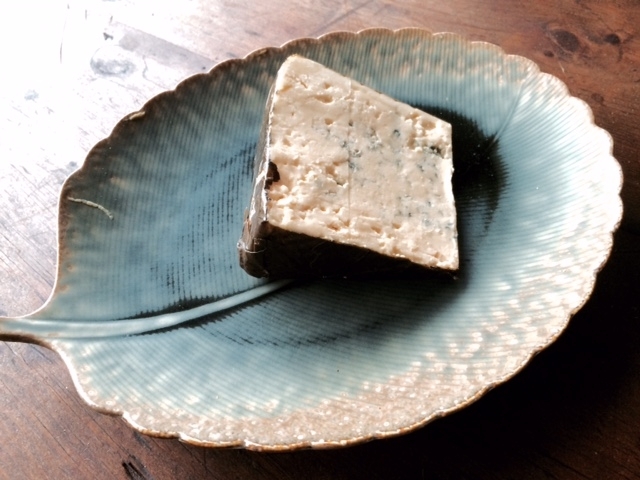 Choking a bit, I studied the leaf-wrapped blue-veined cheese, wondering aloud how it’s made. This special Rogue River Blue is remarkable stuff. It costs a fortune, but it’s a rare treat, available in limited quantities during the fall. Try to taste it now because it’s usually gone by Christmas. Wolfgang Puck has conquered so much of America, it’s hard to believe he’s only now getting around to New York. But he’s arrived with a bang at his new Cut in the Four Seasons Hotel downtown. It’s dark, cozy, romantic, loud – the kind of place that wants to send you out the door saying, “Boy that was fun!” It’s also inventive and up to the moment. 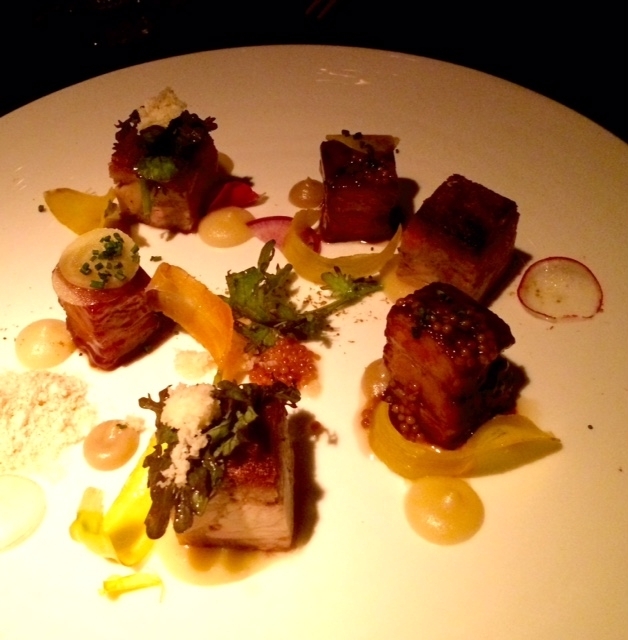 Consider, for example, the pork belly pictured above. Half the chefs in the country are doing a version of the pork belly sliders David Chang first made famous at Momofuku Ssam bar – but Cut does it differently. 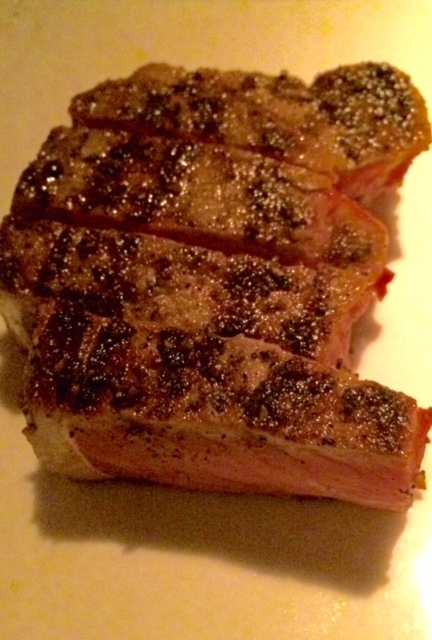 The pork is from Mosefund farm, and it comes with roasted apples and mustard seeds. You make your own sandwich, placing the crisp pig between two white circles of dough. 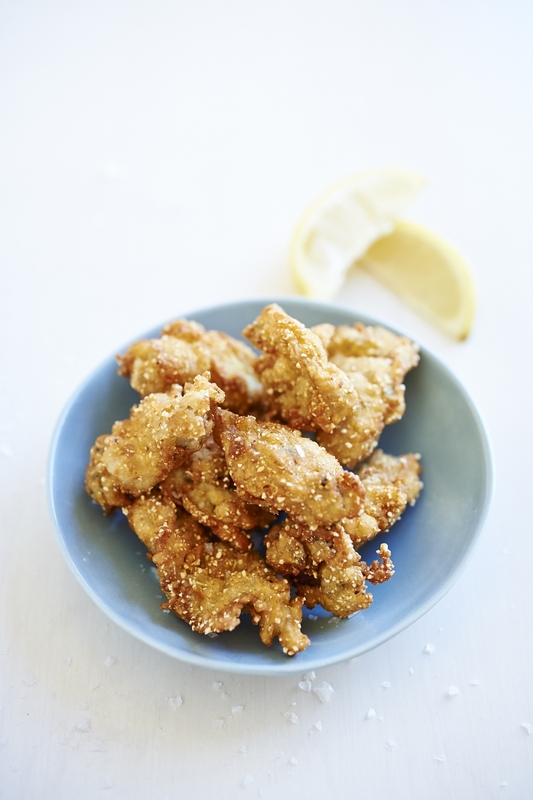 Each one of those little dribs and drabs adds another level of flavor and sophistication. We couldn’t stop eating them. 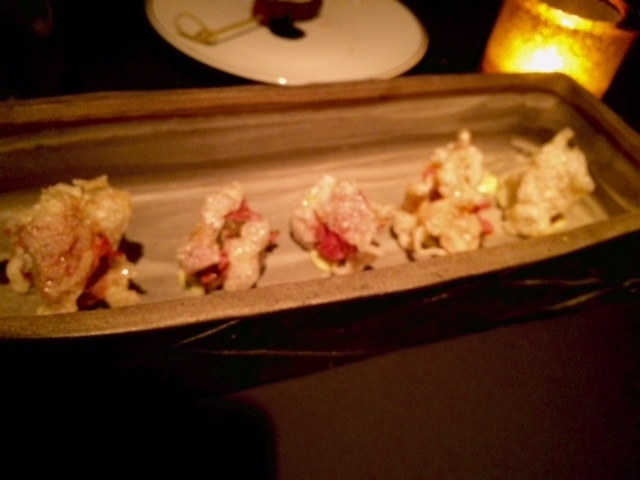 This is the Cut version of tuna tartare. 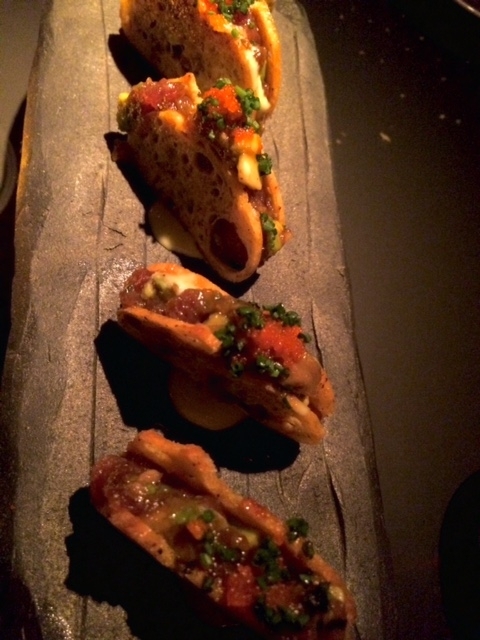 With togarishi crisps, wasabi, soy… the flavors dance around in your mouth very happily. And this is their steak tartare, which has a kind of thick egg yolk jam that adds a new layer of richness to the beef, and crisped beef tendon that gives it crunch. Another totally addictive treat. A little sashimi – of course! 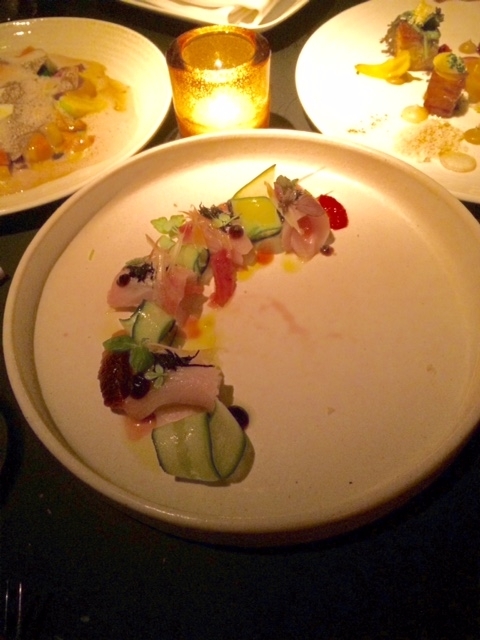 – hamachi, blood orange, ponzu, cucumber. 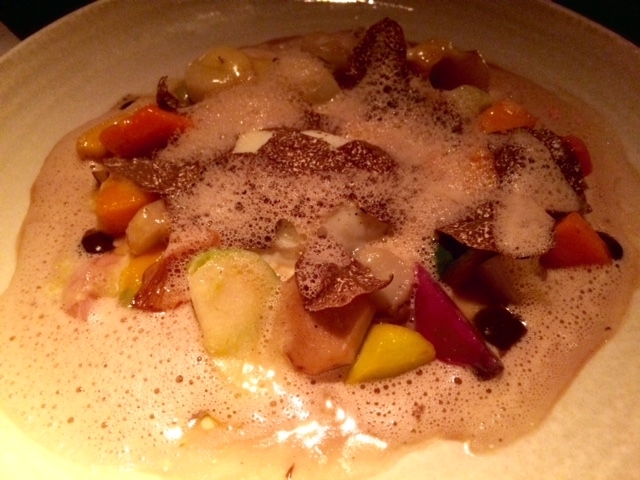 Tortelloni with corn, mascarpone, cheese… a delightfully gilded lily. 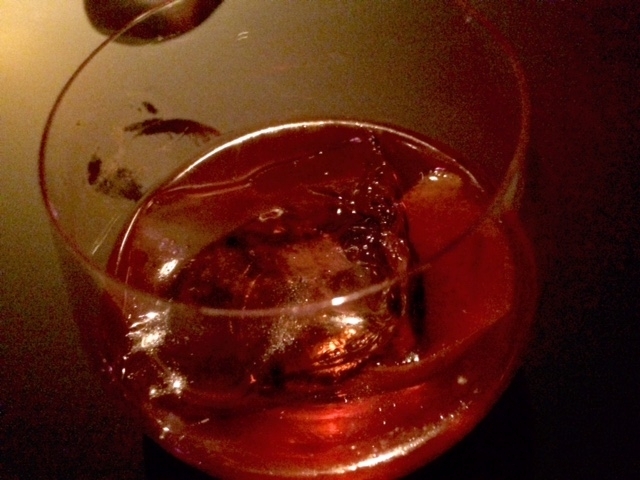 From the Negroni cart: the perfect expression of the drink of the moment. The scent of citrus leaps from the glass. And the glass is a joy to hold – smooth, a little too large, rounded – with the biggest ice cube you’ve ever seen smack in the middle. 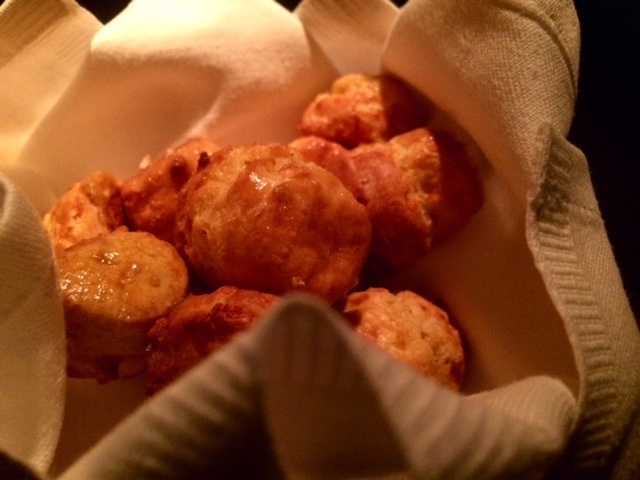 It arrives with long parmesan crisps and a basket of gougeres. and creamed spinach that looks so unappealing in the photo I took that I refuse to subject you to it. Take my word that it tasted far better than it looked. Other dishes that did not enjoy their moment on film: bone marrow flan, served snuggled into the bones, which turns out to be the perfect way to stretch marrow into more. I also loved the mush of mushrooms on the side. 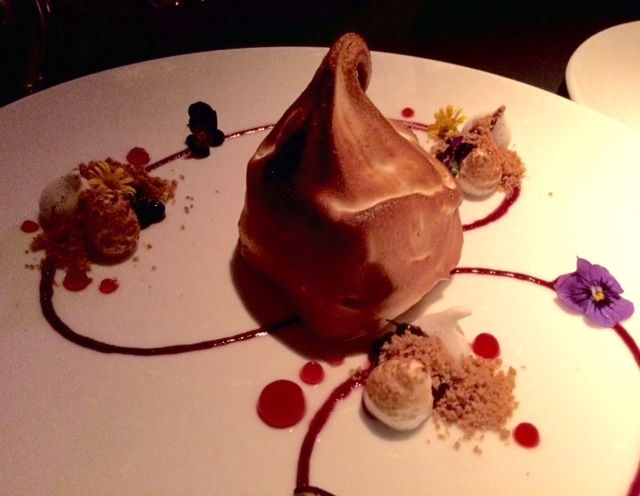 Desserts, on the other hand, are pretty: I especially liked this baked Alaska. Cut strikes me as the perfect expression of the up and coming FIDI area: lots of inventive nibbles followed by straightforward red meat. The truth is, you might want to come just for a Negroni – and to watch all those beautiful people come pouring through the door.